This is the process of adding a new material on the surface of an old patio. It gives the space a new look and extends the lifespan of the existing slab underneath. The most popular resurfacing option for patios is a stamped concrete overlay. It offers a wide range of patterns to choose from, such as brick, stone, wood, and more. A spray knockdown texture is also popular. It is not as highly decorative as a stamped overlay, but it has the subtle but lovely texture. Both are slip-resistant so you don’t have to worry about slips and falls. 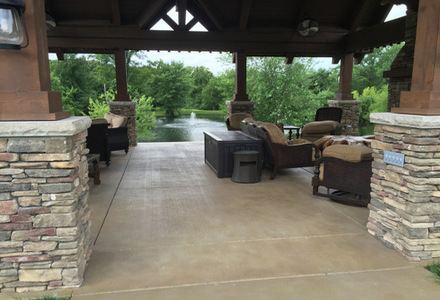 Refinishing is another decorative concrete option that involves changing the finish of the patio but not covering the entire top layer of the concrete slab. This is a highly recommended option when it comes to covering up unwanted stains and discolored concrete. Acid and water-based stains are available in a variety of colors. Paint is a good option but it does not last as long as staining concrete patio. There is a tendency for it to separate from the patio, crack, and peel off. But there are certain types of paint now that is infused with epoxy, which is a material that enhances adherence and durability. Get creative and paint a mural on the concrete patio if you want something that makes a statement. You can also choose from more traditional patterns like stripes, dots, checks, swirls, and the like. Setting up rugs on outdoor spaces is a trending concept nowadays, especially on concrete patios. If the patio is not that appealing to you anymore and you are not ready for anything permanent, like decorative concrete, then why not add an outdoor rug? It gives the concrete patio a new look and increases its comfort level without having anything done on it.